Whether you have read it or not, James Joyce’s main work Ulysses had a huge impact on literature. The novel follows two protagonists and their actions around Dublin in Ireland, over the course of June 16, 1904. And we in Dublin are pretty proud of our own literary genius Joyce (even though he left Ireland at the age of 22 and stayed mostly abroad until his death in 1941) – so if you happen to be in Dublin today, don’t be surprised if you see men and women wearing outfits from the 1910′s, reciting Ulysses on street corners. It’s Bloomsday after all. Bloomsday is when Joyce-afficionados from all over the world meet in Dublin to re-enact the happenings from the novel. Aided by many events and festivities (mostly organised by the James Joyce Centre), this is a great opportunity to combine a walk around Dublin with some literary quirkiness, and to learn more about James Joyce and his life. But Bloomsday is not limited to Dublin – there are events all over the world, and I even found a GMap-mashup to recreate a Ulysses-walk in your hometown. If you are in Dublin today, you must have a gorgonzola cheese sandwich and a glass of burgundy for lunch at Davy Byrne’s, just like protagonist Leopold Bloom did on June 16, 1904, around noon. Happy Bloomsday! 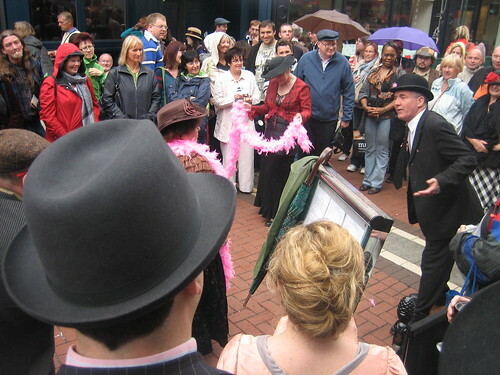 Have you ever taken part in Bloomsday festivities? Tell us about it! The end of Australian writing? Marcel is a German expat living in Ireland and working for an online company with a colourfull logo. He loves doing stuff with words, and did not go to school to learn this. He likes Heavy Metal and trains and dislikes many other things. He is so old he still buys CD’s, but has not yet caught up with the idea of becoming an adult. I still have to read Ulysses – I’ve been putting it off because I don’t find Joyce very accessible. I should make the effort though. Must be a lot of fun to be in Dublin today. Especially to peek in at Davy Byrne’s at lunchtime and see a room full of people eating gorgonzola cheese sandwiches! I must admit I’ve only read some specific pages we studied in literature class, so, I’d like to see those actors reciting the book and learn a bit more about it. Have a good Bloomsday!